Less than 5 % of all strokes. Prognosis more benign than initially seen as smaller infarcts now diagnosed more. Even small amounts of cerebellar oedema can acutely increase intracranial pressure (ICP) or directly compress the brainstem. 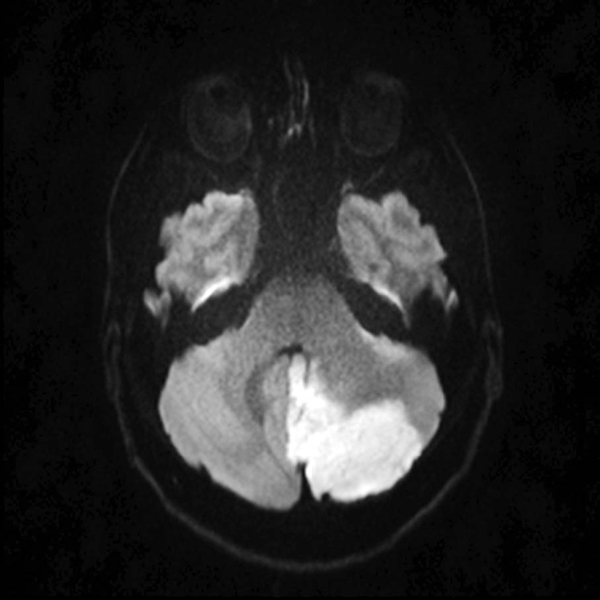 Very small cerebellar infarcts (diameter <2 cm) are a frequent finding on MRI. Superior cerebellar artery: May also supply lateral midbrain/pons. The SCA territory is in the superior and tentorial surface of the cerebellum. It comes off the basilar artery. Anterior inferior cerebellar artery: May also supply lateral pons. Comes of the basilar artery. Posterior inferior cerebellar artery: May also supply lateral medulla. Comes of the ipsilateral vertebral artery and supplies lateral medulla and inferior surface of the cerebellum. 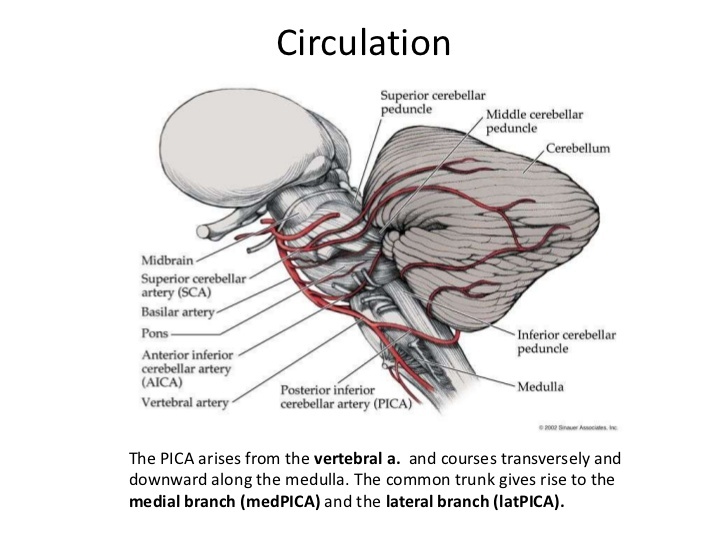 The PICA and AICA are in balance, if one is smaller the other larger and vice versa. Venous drainage by the superior and inferior cerebellar veins. They drain into the superior petrosal, transverse and straight dural venous sinuses. Head or neck pain consider vertebral artery dissection. Alcohol - it is not unique for a person with a cerebellar stroke to spend a night with the police as a "drunk" until patient doesn't sober up ! Coma with Brainstem (pontine) compression and acute hydrocephalus due to obstruction of the IVth ventricle. Coma is most reliable clinical sign. ABC, Admit to HASU or ITU as needed. Comatose may need airway protection and intubated and ventilated. Coma usually develops post admission depending on onset time. Prophylactic suboccipital decompression of large cerebellar infarcts before brainstem compression, although not tested rigorously in a clinical trial, is practiced at most stroke centers.